Both these measurements are intended for determining the resistance. They differ in terms of the kind of component being measured, what translates to the range of values being measured. In case of resistance of electronic components, it falls within the range starting from tiny fractions of an ohm and ending with megohms at the most [MΩ]. Value of insulation resistance is often expressed in gigohms [GΩ]. In order to measure such a big electrical resistance, measurement voltage has to be far higher than it is in case of standard resistance measurements. This voltage is often within the range from 100 VDC to 1000 VDC and it cannot be used for measuring resistance of electronic components because they could be damaged. It is obvious that additional requirements connected with construction of a meter and user safety are applied in case of generating such high voltage by such small device. This division relates to causes of these surges. The second group includes atmospheric surges caused by environmental phenomenon, mainly by atmospheric discharges. Their division depends on the distance from electrical installation. The strongest surges are caused when a lightning directly strikes electrical installation. In the second place there are surges caused when a lightning strikes in close proximity to electrical installation. Atmospheric discharges that take place between clouds are less significant; of course, the closer the distance to electrical installation, the stronger the discharge. Atmospheric discharges can also be caused by radio waves. Division of surges can also be based on their duration: they can be pulsed or long-lasting. Volume and surface resistivity are two basic parameters of dielectrics. Volume resistivity It relates to the current flowing inside insulation material under the action of an electrical field. It is always measured with the use of indirect method: volume resistivity is measured taking into account the effective area of measuring electrode and thickness of a sample. It is not easy to conduct measurements of this type due to the low flowing current. That is why while measuring volume resistivity of a given material, it is recommended to examine a lot of samples and average the results, especially when examined material is of variable structure. Surface resistivity It relates to the current flowing on the surface of examined material. It is measured indirectly: surface resistivity is measured taking into account the effective length of measuring electrode and width of space between the electrodes. The measurement is not easy because the surrounding environment has influence on surface resistivity; this is clearly visible in case of materials having high resistivity. It is recommended to measure volume resistivity with the use of three electrodes: measuring electrode and protective electrode on one side of dielectric, and voltage electrode on the other side. Measuring surface resistivity looks similar except that the electrodes are in different places: measuring and voltage electrodes are placed on the same side, whereas protective electrode is placed on the other side. Standard and handheld oscilloscopes are equipped with similar functions. 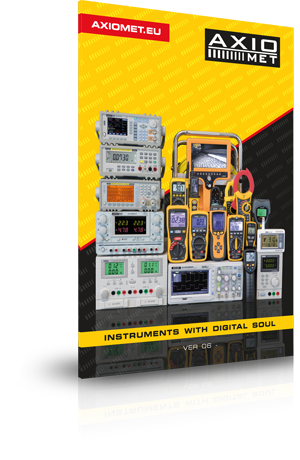 Handheld version is often equipped with separate input ports intended for conducting measurements typical for multimeters. Standard oscilloscopes are typically used in labs; they are put on the table. make it easier to monitor operation of large, stationary machines and hard to reach places. Nowadays, it is possible to find 4-channel handheld oscilloscopes. Their price is usually higher than the price of standard oscilloscopes with similar parameters. IP67 protection class ensures that a device is protected against the effects of immersion in water. It can happen by accident during standard operation of a device. It does not mean that a device can be used under water or cleaned under high pressure of water. IP67 class allows for immersing small devices in 1m deep water for up to 30 minutes. If a device is going to be used under water permanently, a device compliant with IP68 should be bought. Restrictions connected with IP class must be specified by a manufacturer individually. When there is a need to use pressure washing, it would be good to decide on products with IP66K or IP69K protection class. In the first case, a device is protected against effects of immersion in water for a very short period of time. It should be mentioned that IP67 class ensures full dust-tightness of products. Frequency sweep feature allows for generation of waveform having certain parameters. One of these parameters – that is, frequency – changes cyclically. additional parameters, such as duty cycle. Then, they indicate the way in which signal frequency is supposed to be changing. frequency ramp-up type (e.g. linear, logarithmic). The signal generated this way is used mainly for examining frequency characteristics of devices and components. Moreover, it can be used to control other devices for which frequency of input signal constitutes information about way of operation. Dew point temperature indicates how much a surface in a specific habitat with air must be chilled in order for water condensation process to start. The higher the level of relative humidity, the more easily the process of water condensation occurs. It means that when the level of relative humidity is high, dew point temperature is also high (it is not very different from the current temperature in a given habitat). Dew point is also directly proportional to ambient temperature. It results from the influence of humidity on the difference between ambient temperature and dew point temperature. It is worth noting that dew point temperature depends on the pressure in a given habitat (the higher the pressure, the lower the dew point) but in most cases it is enough to take air temperature and relative humidity into account, which take dependence on pressure into account themselves. European standards define specific values of light intensity for particular rooms. For example, light intensity in classrooms at schools should be equal to 300 lx, in labs from 500 lx to 1000 lx, and in operating rooms – above 1000 lx. Measurements are conducted on the work area with the use of lux meters located in evenly distributed points – usually every 1 m.
Too big differences in luminance in a human’s field of view may cause the so-called dazzle, what makes it difficult to recognise objects. Light pulsation can be a problem too because it causes stroboscopic effects. Colour rendering is equally important. Standard light of a bulb is warm and more natural for human eye, whereas light of fluorescent lamps is usually cooler. In case of LED lighting, the kind of LEDs used is the most important. Good, universal room lighting should be based on light source which emits radiation in visible range which is as similar to sunlight as it is possible. Shading defines how much the light source is concentrated as a result of which it generates shades.